Alongside key topics and expert insights, we understand how important networking is to you. Our seminar continues to bring you an opportunity to meet and establish business discussions with industry market players. We hope you can join our networking reception, sponsored by BNP Paribas. The reception will be held in Rechte Pirouette, Imperial Riding School Renaissance Hotel, following the seminar. 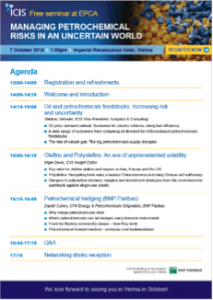 Join us during the 52nd EPCA Annual Meeting and network with our consultants, editors and product experts. We will be pleased to meet you in our suite Ballroom B, Marriott Hotel to share the latest news on the petrochemicals industry, and answer any questions you might have about the markets. 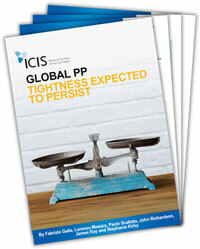 New PE capacities coming on stream globally- and particularly in North America – are having an impact on sentiment and pricing in some areas. 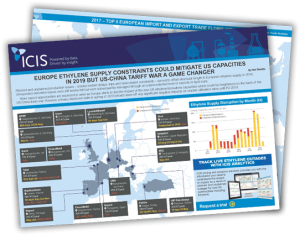 The trade spat between China and the US is expected to affect trade flows globally with the impact on global supply and demand balances far reaching. 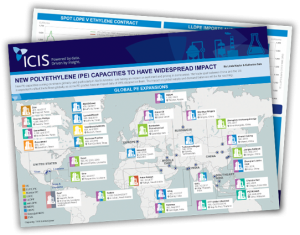 Planned and unplanned production issues served to offset the underlying structural length in European ethylene supply in 2018. More export opportunities are expected to arise, alongside a heavy shutdown slate in 2019 which should help to stave off any significant negative impacts. 2-EH has been more supported than NBA and IBA through the year. With some hurdles still to jump, will NBA and 2EH pull in different directions in the months ahead? 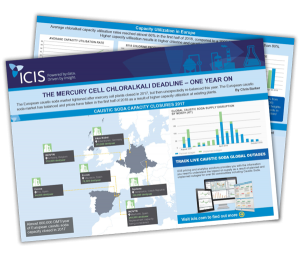 As we approach the anniversary of the 2017 phasing-out deadline for the last mercury cell caustic soda and chlorine plants, a review of the market shows the ways in which the chemical industry has adjusted to the change through higher utilization of existing capacity within Europe. 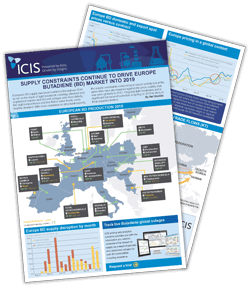 A tight supply and demand balance has kept the European butadiene (BD) market firm in 2018 and this trend looks set to continue into 2019. 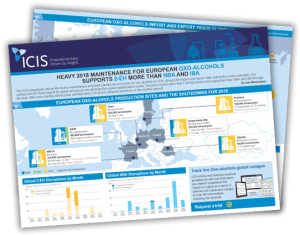 This infographic highlights the key production issues that have constrained supply and the impacts these limitations have had on pricing and trade flows throughout 2018 so far. 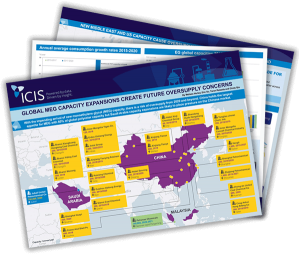 Download this ICIS infographic examining the upcoming arrival of new capacity in the US, Middle East and Malaysia and the likely impact on global trade flows in the next few years. 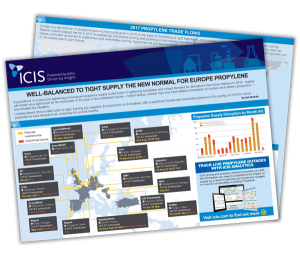 ICIS consultants detail what future investment in new #propylene and PP capacity within Europe indicates for imports of European processors.